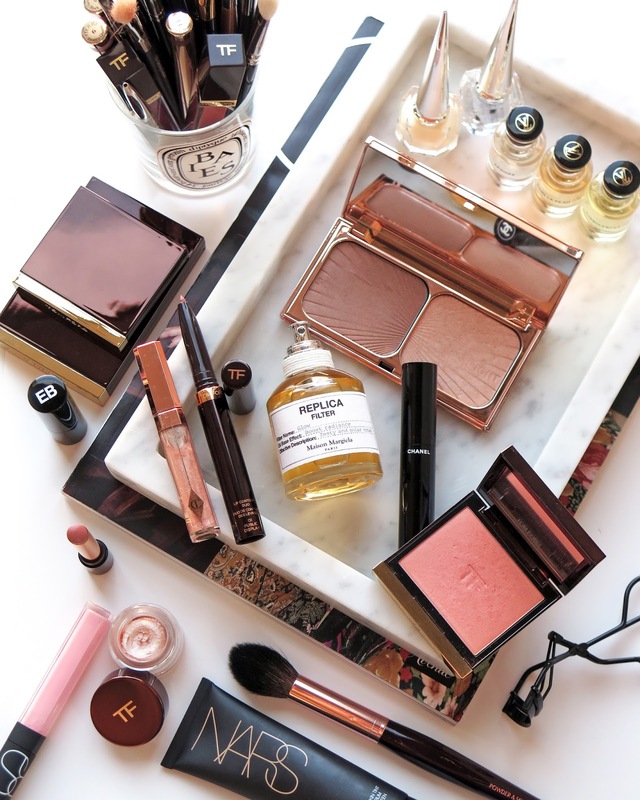 Rounding up some of my beauty shelfie favorites right now including more thoughts on the best clear makeup bag I’ve found along with a new hair oil I just discovered. A quick look above at one of my shelfies. I’m constantly reorganizing things and trying to find better storage solutions to stay organized. I finally put together more of the Ikea Billy Bookcases which I find more convenient these days compared to the Alex Drawers. Having an open shelf allows me to see things better vs. a set of closed drawers. I still also make a lot of use out of acrylic storage units and clear shoe boxes to store items. I hope to have an updated post but in the mean time you can see how they were put to use when we lived in San Diego here. I’m highlighting my favorites below, but if you want everything on the top shelf photo listed out, scroll down to the bottom of the post! Byredo has been a long time favorite and a mini hair perfume trio just launched in two variations. I bought the Triplé Gannant Bois Hair Perfume Trio which has three 30 mls vs the 75 ml individuals. The trios are pretty expensive but I’m obsessed with how cute they are. The one I ordered has Mojave Ghose, Bal D’Aftique and Gypsy Water. I’ve also been loving the candles from the line – they’re really strong and have excellent throw. Tree House has been burning at our home lately. It’s not really a summer scent but I love it any time of the year. It has notes of cedar, bamboo, sandalwood, guaiac wood and hay. For perfume my new go-to has been the Jo Malone Neroli and Basil perfume. I still have my others in frequent rotation (Spring to Summer Fragrance Edit here with my favs from Creed, Tom Ford and more). But the Jo Malone one has been a new favorite. It’s fresh and light and I find it pretty strong. Even though the Nordstrom x Hourglass Ambient Lighting Blush Palette has 2 existing colors I already own I find myself reaching for this palette a lot. You can see the full review here. For lips I’ve been loving the Sisley Phtyo-Lip Delights but for more color the NARS Full Vinyl Lip Lacquer in Santo Domingo is the perfect neutral light pink and the Pat McGrath LUST Glosses are perfect for a medium wash of color (Flesh Fantasy shown). I’ve linked all the swatches above. So many of you have been asking what the nail color is that I’ve been wearing – it’s OPI Samoan Sand, but with three coats. For some reason I always felt it was too warm/dark for me, but I just looked at it recently at Ulta. Maybe it’s because I’m more tan now but it’s like my perfect everyday neutral that isn’t too pale. On the nails here and here. The best clear makeup pouch pick for me is still The Daily Edited Transparent Cosmetic Case. The color shown is their Pale Pink but I also have it in Taupe and Black. You can see the full review, dimensions and colors side by side in my post here. Quality is on point and I compared it to the ones from Anya Hindmarch and Truffle as well. I’ve received a number of questions on which color is my favorite. I really find that hard to answer! I don’t think you can go wrong with any of their options. Also for monogramming questions I often get the small font size with a blind monogram. Other beauty favorites right now include the Omorovicza Queen of Hungary Mist because it’s lightweight enough for humid weather but still has enough hydration to refresh the skin. I mentioned that I ordered the La Mer Moisturizing Matte Lotion and I’ve been testing it for a little over a week and really like it for this humid weather here in Florida. It has a soft matte finish but is still moisturizing on the skin. I’ll have to test it more for a detailed review but first impressions are really positive for me. Gisou launched a travel size of the Honey Infused Hair Oil and they sent one for review. It’s the best smelling hair oil I’ve ever tried and I’m usually not a fan of honey scents. It’s thick/dense in the bottle but a little drop does blend well when warmed up in the hands. It adds moisture and shine. I only need a tiny bit from the middle to ends of my hair. It’s just what I needed as the heat and water here tend to dry out my ends. You can find the full size at places like Revolve or Urban Outfitters as well. Right now the Travel Size is only available on the Gisou website. Last but not least I’ve been really liking the By Terry UV Base. I reviewed it here in this post. It has SPF 50 and really does prevent the burn and while nothing here can truly prevent the tanning process from the sun, I feel like it has minimized it. I still like the Supergoop! Unseen Sunscreen but sometimes it’s nice to rotate. I feel like the By Terry one has less slip/silicone-like feel. Sunglasses below are from Kate Spade. I bought them in two colors from the Nordstrom Anniversary Sale – it’s so hard for me to find frames this size and I love them. The color on the sides/back also make for a fun accent. What have you been loving lately? I love reading about your beauty favs! Press samples featured include the NARS Santo Domingo, Pat McGrath Flesh Fantasy, Gisou Hair Oil, By Terry UV Base. Other items purchased by me.